We’re going to feel even worse than we do now when we have a crack at Three Peaks! This entry was posted in ER Poetry, Other Ride Reports on 26 February 2013 by Drastique. None of the ER’s were stirring, (just Cathie checking the radar at 3am?!). Visions of the “undulations”, playing over and over in their heads. In the hopes that come morning, our legs would still be there. Everyone else in jeans and jumpers, assuming the girls’ heads were full of bricks. The radar warning of mischief, cancellation text messages hurriedly sent. For Drastic, Zlatko, Briony and Cathie, the desire to conquer Charlottes Pass was simply too great. Wondering what the mountain held, whether it be rain, wind or possibly snow. Leaving Zlatko, Cathie and Drastic, to fight for the title of the first to conquer hell. Piloted by the holy Saint Nav and Saint Nick, providing the encouragement to ensure she would arrive. And then did some more climbing, and then there was some new climbing. The pain in her legs, not made mention of in any of PD’s brochures. When a noise caught Briony’s attention.. NOT ANOTHER FLAT…. YOU FU&@#^! BIT#! Leaving Briony alone, adding to her poorly timed punctures streak. Dave stopped to lend assistance, Cathie continued with a wave. Saints Nav and Nick arrived, with Drastic’s wheel as a spare. Briony arrived at the top – a new trophy for the case. The thought of finally being able to take of wet and cold socks – simply sublime. Laurie and Dave in the other vehicle. Everyone who bailed on Sunday missed a fantastic ride!! The bongo’s had been doing their thing overnight, drumming up a ready rabble of ER for the second best way to start the day, and if you felt the earth move in the early hours of the morning, it was explained by the appearance of the Goose for a triumphal march into town. The ER peloton’s centre of gravity was therefore shifted towards the rear of allowable limits for slightly unstable flight characteristic, the tail wagging the dog so to speak. Rule #80 20 of the North Shore’s finest strapped on the lycra and rolled out at the appointed hour, BOF nowhere to be seen, Rule #87 prevailed. But then it takes 5 minutes for the peloton to get moving, and almost immediately stopped as heaven forbid a car was on the first roundabout and cleaved the peloton into two. Formation then went a little ferral, scrambling over the hills of death, and finally into Lindfield, YHC latched onto the Phantom express and was towed to the front and through Rawhiti sprint somehow on point, although hypoxia soon meant all situational awareness was lost. Still battling traffic through Roseville but a clear patch got the peloton onto Archer in short order and greens through Chatswood made this an extraordinary day, ( at least for Phantom and YHC as we arrived at the Tindale regroup with a minute or two ahead) A larger group now took off for the shuffle through Artarmon, with approximately 28 rolling down the hill.. The turn left onto Burra Rd, is usually a fast one, however just another PPB on the fact that other road users may in fact be there too..you really need to be aware of the traffic from the right, but if you have a clear right, try not to be tempted to “hack” into the turn and drift …this morning there was oncoming traffic ..I suppose the message is that common sense and courtesy to road users is one of the FMs guiding principles..
A very orderly transfer through the shared user path ensued, special care on that section as there is still a gumtree lying on the side of the path just before the scaramanga climb. Traffic on this section was numerous and mixed, dam these cyclists who gave them permission to be going the other way and how come there are so many of them..
Burlington smoulder instead of burn as prevailing conditions were too pleasant to ignore, and another huge regroup ..for a mass transit through north Sydney..and if there was anyone with a greenlight button in the peloton it was in full use today, a steady roll through all traffic lights and into the Lavender St dip before you could put a toe on the ground, and once again the stairs to the SHB were jammed with ERs , girding their loins for a final sprint to the B&T..yes sometimes the SHB is useful for one last effort before the BS and planning session over coffee. B&T was in top form, although they had allowed some ladies to occupy the sacred space..the ladies quickly worked out that 30 odd lycra clad MAMILS were about to surround them so they retreated to a side table quick smart.. and then the mayhem continued as waves of ER rides arrived, the Epping chapter, followed by the stragglers running late on the OTP, the early crew were already caffeinated and on the march before the Fluffers arrived, and several were into their 2nds before finally admitting to having a job to go to. Another welcome back to the chief who promised to make the OTP a bit more frequently now, ( he must be on a recruiting drive ) Return rides ..all the usual, with the usual at the usual.. This entry was posted in Commute Reports on 26 February 2013 by BT. 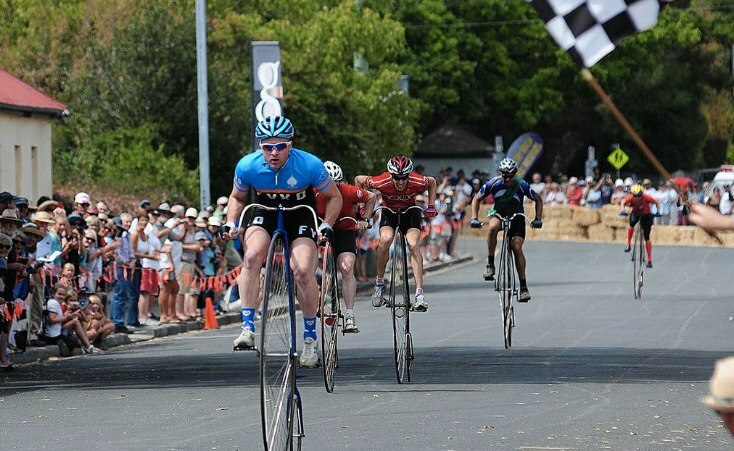 While the annual Thredbo training camp was held the TSS took a break and headed down to Evandale, Tasmania for the 2013 edition of the Evandale Village Fair and National Penny Farthing Championships. This year was the 31st running of the championships at Evandale. The town itself is located 5km from Launceston airport and 20km from Launcestion city centre. The event is held within the Evandale Village fair and is the main drawcard once you visit the car show, steam engine show, vintage motorcycle show, bands, food stalls, markets, more bands, art show, cat show, dog show, rabbit show etc, much like the Royal Easter Show except there are around 60 penny farthings racing around. Now before you ask, no I don’t own a penny farthing, I borrow one off a collector and manager of the NSW team. We arrived on Friday after flying in with ‘Delaystar’ from Sydney. The bikes were transported down over a week earlier via standby airfreight. Once we collected the hire car and strapped in the youngsters we headed to Evandale to register and go for a training ride. It had been 5 years since I rode a penny farthing (PF) and 5 years since I had been to Tasmania, nothing much had changed. We met the organiser, signed on and collected the ride pack. Strapped on a helmet and did 30 mins on the PF around the streets of Evandale, down the hill out of town, back up the hill and finished off the training session with 2 sprints at 80% before cooling down, all felt fine for race day. Reading the race pack (form guide on the competition) there were 61 riders entered from the ages of 8 to 83yrs old. Most riders are aged between 20 and 60. Race Day: The kids didn’t sleep in so I took advantage of arriving early to do some more hot laps of the actual race course before we got down to business. I borrowed Dragons and Danny Boys helmet cams (thanks to you both) and took some footage of the warm up for you all to enjoy. I couldn’t wear the cameras during racing unfortunately as this footage would have been even better. The day presented some very close racing with plenty of action. There were two crashes during the day with one broken bike and one member of the crowd being taken out by a flying rider who happened to run over a mouse in the middle of the corner in front of the pub (refer footage), this shot him across the road and into the crowd. The mouse who had been residing in one of the workcover approved hay bales died instantly. The Slow race, riders must move forward at all times within a 2m wide lane, the course is 10m long. The slowest rider of each heat progresses to the next round until 4 riders remain. These 4 then ‘ride off’ for gold, silver, bronze and 4th. I managed to win my first heat then missed the second round cut by about 10cm. Final ride off placed me in 6th. The Slalom race, riders ride around 10 witches hats over a 50m course from a standing start. The top 8 fastest ride off for medals. I qualified in 5th at 11.35 seconds. Unfortunately I didn’t get a good start which is paramount in this event and lost the next round by about 30cms at the finish line. Final ride off placed me 5th. The sprint. A standing start 200m straight line sprint race. The top placed rider of 8 heats progress to the final round. I qualified in a time of 15.56 seconds to make the final round. The final round was slighly quicker and I was just pipped for third place and ended up 4th in the photo finish for 2nd, 3rd, 4th and 5th. The Relay. This is a hotly contested event and is based by state and/or country. NSW fielded 2 teams of 4 riders per team, however we were a little light on horsepower so we adopted the approach to have our slowest rider go first and we would then chase. This worked reasonably well however our slowest rider wasn’t as confident on the corners as the rest of us so we had to make up time and positions as the race went on. Another 5th place in the end. The Obstacle race. This is the PF version of cyclocross. The course is 100m long in one direction. The race consists of running the first 100m, carry your PF back to the start line 100m, then run with the PF wheels on the ground, then ride the last 100m to the finish. A big field started the race with the usual chaos of flying bikes and bodies. 5th place in the end. The national championship heats, I was scheduled to ride the last heat with the top 2 to progress to the final round. The second and fourth heats contained high speed crashes which took out one of the previous winners of the national championship. My heat was reasonably quick. I stayed up the front of the group of 12 out of harm’s way which worked well. A little sneaky breakaway in the last lap secured a spot in the final with me placing second in the heat to local sensation rider much to the crowds delight. The National Championship. The open category now had the top 8 riders of which contained 4 previous winners. We were introduced to the crowd and completed a parade lap. Tension was high as the gun went. Immediately James Fowler (NSW) went to the front and set a pace so high that after 1.5 laps of the 500m course we had dropped three riders, now down to 5. At this stage I was finding the pace tough but was sitting pretty in 4th position with the local sensation in 2nd position, Sean Hennesy in 3rd (VIC) and Heath Blair (Tas) in 5th position. The pace eased in the 3rd lap and that’s when the tactical battle started. There were a few close calls in the corners but somehow I managed to get myself into 3rd position as we entered the 4th and last lap. The last lap pace was even quicker and into the 2nd corner I felt the bike sliding slightly. I kept the power on as I started to set myself up for an inside manoeuvre on the last corner as practiced earlier in the morning. Sean launched his move in the corner and I was ready for it, unfortunately he had more horsepower than me as I chased hard up the final straight, passing James half way up the final straight to take 2nd place, James took third. Over 50’s National Championship: 2 laps of the course. Won by a New Zealand rider this year. Over 70’s National Championship: 2 laps of the course. Won by local rider. Women’s National Championship: 2 laps of the course. Won by English rider. Elimination Race: The last rider past the finish line each lap is removed from the race until the final 4 sprint for the placings. 3rd place in this one. Handicap race: Run in reverse direction, the 4 top riders were off scratch with 40 seconds delay on the slower riders. The race is 4 laps and we managed to make the top 10, 6th overall. The photo is about 30m+ from the actual finish line of the national championship. Sean (the winner) was about 3 bike lengths or so in front of me (in red with white helmet). I was slowly catching him but not fast enough. Sean was the fastest rider of the meet. So a fun day with one silver and one bronze medal brought home. The kids loved it and my wife seemed to have a good time too. Hopefully I will get a leave pass to ride in the event again next year. This entry was posted in Other Ride Reports on 26 February 2013 by Brownie. Like the semi-professional LDF & eponymous Virgin, the decidedly amateur Dora was born in Johannesburg in the early ‘70s. Shortly thereafter, motivated in equal measure by a distaste for apartheid and the lure of the wide brown land of opportunity, Dora’s hippy parents set sail for these fair shores and settled into a quiet existence on the Mid North Coast of NSW – a five acre bush block, 5km out of town on the road from Kempsey to Crescent Head. From the early days as a country kid there were bikes around. Typically battered but well-loved, these dragsters and later BMXes, were great liberators from the boredom. All the best (and most dangerous) adventures were made possible by these faithful machines. Behind YHC’s house, a long dirt track led to an old quarry which became a primary source of entertainment and escape. Hours were spent building jumps and circuits and sliding in gravel with increasing risk to limbs and skin as we egged each other on to ever more dangerous efforts. Years later YHC has a family of his own (wife Lana, kids Will (7) Rafael (5) & Abi (2) – the latter famous for indiscriminately assaulting other revellers with a golden reindeer at the ER Xmas party) and is settled on the North Shore of Sydney not far from Artarmon station. About six months ago, a career change found YHC again commuting to the CBD, riding some days, catching the train others. YHC heard tell of a ‘bike bus’ populated primarily with MAMILS that ran down the Nth Shore line. Next day, slightly miffed at the delay, YHC was required to wait before crossing Tindale to catch the 7.05 to Wynyard as a long stream of Egg and Tomato clad warriors mounted on steeds of steel, alu and carbon flew past. Minutes later, crammed into the BOF cheek and jowl with the Muggles, YHC resolved to intercept the peloton and do his best to keep up. YHC has been doing the same most every day since. From there it’s been brilliant fun getting slowly fitter and faster with no end of additional challenges to extend the 10km sprint from Artarmon to the CBD – early dashes up to Gordon for a full run in, Rhodes on a Friday, Fluffers, Flambies and, best of all, the sacred pilgrimage to the GG for Friday prayer. 4. Tell us about your bikes? For the first few months YHC has been chugging around on an old but extremely reliable Trek 1000 purchased for $500 from a friend a few years ago. Come Christmas, Santa found the name ‘Dora’ at the top of the ‘well behaved’ list and rewarded him with a Trek 5.2 which he’s been riding ever since. However, ‘n+1’ syndrome has set in – these days YHC is often to be found with iPad in hand trawling through eBay listings of the sacred steel as well as annoying other members of the peloton with “is that steel?”, “Reynolds or Columbus?”, “really, what number?” and so on. 5. If you could ride anywhere in the world where would it be? It’s a cliché but hopefully forgivable – France when the Tour is on. Once upon a time, YHC was once driving home about 7pm through the backblocks of Sydney’s inner west (between Glebe and Fish Markets). Stopped at the lights with the sun setting in the west, YHC could see a cyclist coming from the right and a car coming from the left which was slowing to turn right across the path of the cyclist. Perhaps assuming he’d been seen the cyclist continued to pump along at a fair clip through the intersection. The motorist slowed but then accelerated through the right hand turn and perfectly t-boned the cyclist sending him spinning into the air before crunching onto the road. YHC flicked on the hazards and went to the assistance of the cyclist who was in shock and pretty banged up. At this point YHC observed his courier’s livery. True to form the first thing he wanted to know was “is my bike ok?” and took it badly when the mangled device was dragged into view. To truly add insult to injury, the motorist then began berating and swearing at the bike courier for “not giving way”. So the next few minutes YHC had his hands full trying to call Ambulance and Police, keep the patient still in case of spinal or other injury and intervene between him and the driver (who’s next move, once the severity of the incident was apparent, was to try to depart the scene before the constabulary arrived). Said officials were there quickly and YHC was able to leave the situation in their capable hands after providing details and a short statement. Next day YHC was at work in the city visiting a customer. Coming down in the lift the doors opened at another floor and in stepped a bike courier with a heavily grazed face and his arm in plaster. Sure enough it was him (what are the chances?) and we stopped and chatted on the ground floor. Turns out the bike was a complete write-off, the wrist was broken and he was still shaking off the mild concussion. Never knew his name but is should be ‘Ken Hard. The jokes are funnier at the back. When I was younger I lived in Japan for a year and for a few weeks I dated Nicole Kidman’s cousin (not at the same time). This entry was posted in Rider of the Week on 25 February 2013 by Drastique. Today was a perfect day for me… and so I write the ride report, please see below. Assembly called in Gordon, and rolled beautifully down the hill, just as I arrived exactly at the jumping off point. Once again the siren call of “No Passing Steel Bikes” was called, and sure enough Bam Bam rolls up and exclaims “I am riding steel” and promptly takes off and leaves me in his dust. I think I am going to change the clarion call to “No passing Red/Yellow (egg and tomato) coloured bikes”. That should fix everyone except DT. The roll in was great, despite the hard pelting rain through Chatswood and Artarmon… by the time the group arrived at the B&T all was dry for a nice relaxing coffee and chat. There was a flat in Chatwood (archer st) and a small group collected to have a committee led meeting on how to fix it. They arrived at the B&T only a few minutes behind the group… so could not be too bad…. I’ve been a little scatter brained lately and have lost a couple of things along the way, over the past few weeks. A pair of dress shoes went walkabout 2 weeks ago when I moved my desk back from Market St to Kent St, and a pair of sunglasses went awol about 3 x weeks ago after a stop at the B&T. Yesterday, the shoes turned up when I checked my old desk drawer in the old building… hooray. Today my sunnies turned up when Sarah from B&T came running out to give me my sunnies. Apparently, the sunnies slippled out my helmet and landed in the bushes… it was not discovered until a week later when they cleaned the bushes! The moral of the story… is that if you put enough Love out to the universe, then it seems to reflect itself back to you…. If any of you all wish to reflect Love back to me… I cordially invite you to stand in line, and will get to you as soon as I can. This entry was posted in Commute Reports on 20 February 2013 by Bucky. 5:30 AM Top of Kisso. Assembled: Van Diemen, Wilson, Andy Hulme, and this B1. Damp mist and streetlights add atmosphere to the slight buzz of adrenaline of apprehension: This ride hurt me last time. Pacific Highway, Fox Valley Road, Commenara Parkway onto Pennant Hills road, all prelude, still searching for the all-day rythm when Andy flats, barely 15 minutes in. He swaps tubes in a pool of light from Van Diemen’s bike; mist floats eerily in the beam. We roll through Cherrybrook, Dural and Rouse Hill, in and out of the fog, before hitching a ride with a bunch rolling along Windsor Road. It’s a handy tow for the 15 kilometres into Windsor. We play Lantern Rouge to a single file of thirty bikes snaking along the Hawkesbury Valley Way, a massive concrete structure apparently floating over the paddocks below; red blinking lights and the whole bridge disappearing into the grey gloom ahead. Through Richmond and across the Napean — the river pools and shoals up here, rushing through constrictions and Sheoaks; the locals are out casting for bass along the banks. We stop in the car park for a bite to eat and to steel ourselves for a thousand metres of climbing. The pace has been solid, Van Diemen — the engine room — the driving force behind our 28 or 29 average for the two hours to the escarpment. But soon, after the next short stretch along the river, the big chainrings are dropped, small cogs swapped out for bigger cogs — then the biggest cog — as we tap up through the gums and the bellbirds to the bright blue sky and Hawkesbury Heights. The view here stretches from the north end of the Sydney basin to the south — velvety plains as far as the eye can see, still swathed in morning fog — and the city skyline far away on the horizon. But all we see are metres gained; we roll through the carpark without slipping a cleat, eyes fixed ahead, and up. Andy H slides his helium-filled Baum to the front and takes control of the long drag to Springwood. Nine o’clock when we roll into the village and Van Diemen’s keen for eggs and bacon. There’s a moment of dissonance, a disconnect between my memory of this place — the heat and the gravity and the relentlessly crushing effort — and the idea of settling in for a gentlemanly breakfast. Vestigial traces of urgency vanish with the first whiff of toast and coffee. Full plates of food are delivered — and demolished — quickly. Coffee is loaded like avgas. We pay our bills and fill our bottles. Wilson rolls out on the front, towing us towards Katoomba. In December, this section of the ride just would not end. One elevation after another, grinding relentlessly upwards. Whenever I lifted my head to steal a glance, squinting through the heat and the sweat, I’d see Fore waiting, patient and stationary at the top of the rise. He seemed to float magically from one crest to the next while I laboured away on my cranks. But these are quiet reflections, ripples. Wilson’s tapping out a pace that’s ever so slightly quicker than comfortable — but it’s sustainable as long as I float through my gears, spinning more and forcing the issue less. The mountain won’t be bullied into submission. I trade heart rate for lactic acid. An occasional “ease up, big fella” goes neither astray nor, thankfully, unheeded. We roll through Leura two and half hours after leaving the Napean over a thousand metres below — almost before realising the climbing is done — then coast down the back streets of Katoomba to Echo Point and stand in the clouds with our bikes and broad smiles. The clouds lift, revealing Katoomba’s rough stone bluffs. When Van Diemen points his Colnago down the hill, he takes off like a missile and one by one we file in behind, pushing big gears and hunting for the slipstream. The upper mountains are dispatched in half an hour, then the long drag out to Hawkesbury Heights and the quick, hair-raising descent through the hairpins to the river. We stop for cold drinks opposite the airforce base in Richmond, watching a Piper Cub doing touch-and-go’s on the runway. The rest is business, pulling turns to the east. Rouse Hill, Castle Hill, Pennant Hills, all pass quietly as our legs carry us back towards Hornsby. It’s 3pm when I tuck into a caramel sundae with Van Diemen; the Andies have rolled on for home. The sweet, cold ice-cream is a little celebration I won’t pass up: just over two hundred kilometres on the clock and a halfway decent climb by any standard. The sundae is sticky and delicious. A thought occurs to me as I’m turning the spoon upside down in my mouth: right about this point in ride, in 21 days time, we’ll just be starting up the back of Falls. This entry was posted in Other Ride Reports on 19 February 2013 by B1/m. The pre-dawn rain shower stayed away for this morning’s Fluffer; perfect conditions for a roll along the beaches. Eleven ER’s in the traps (now this will test my memory!) —Satnav, Flash, Fore, Magoo, Ivan the Terrigal, Jamie, Rob, Ben, Scott, Simon, and B1/m CFM (acting.) Big Bird, very pleased to report all regroups conducted in an orderly fashion, the peloton remained nice and tidy through Bayview in the pre-dawn light despite a seemingly endless stream of “cars back” — a bit busier on the beaches this morning. again until just around the corner where Satnav’s rear tyre relaxed in sympathy. First tube fitted — and exploded; Scott diving for cover like we were under fire — second fitted then on our way with nothing further to report from the mechanicals department. Glorious through Manly — a nice little longboard wave this morning — busy up through Seaforth (saw us up, ahem, up on the footpath for a bit; apologies, BG) but all present and accounted for either side of the dip. Safe passage through the lower north shore saw us into the B&T for the tail end of the first sitting, well situated for the second, and in prime position for the morning academicals with Herb in tow. All in all, a fine morning on the pedals. This entry was posted in Commute Reports on 19 February 2013 by B1/m. I am a bean counter who likes to pretend I can ride a bike. I live in Wahroonga where all the aspiring MAMILS congregate. I am married to Megan, who has now accepted my addiction to cycling is not a passing phase and have two daughters who hate seeing their dad wear lycra. We moved buildings and I lost my permanent car spot in 2008. Best thing that happened to me. I hated catching the train to work. One day my boss Ashley Fenton told me I should try and find that bike track from Chatswood to the city as I may like it. My old Giant steelframe mountain bike ventured out one morning in January 2009, found this track and the rest is history. I mentioned to Peter McNamara who was doing some work with me I had started riding. He told me I should join the Easyriders as it was safer than riding alone. I got onto the email list and three months later took my first ride with the group after talking to Captain and Satnav by email. I own a trusted aluminium Argon 18 Plutonium which has survived two crashes and still does the commute well, the Pinarello FP7 which flies up hills as some have noted and still keep my 20 year old Giant Steelframe Mountain bike. I love riding the Adelaide Hills. Want to try a TDF stage one day but still think Adelaide Hills scenery is hard to beat (go Beebs). Has to be my first ride with the Easyriders. The Argon was on a flatbar back then. Satnav said join the group at Gordon and he would hang back with me. He did. I had to push the bike up the Esses at Roseville on my first morning and by Boundary was finding it hard to stand up. It was a damp cold July morning as it had been raining. We got to the Artarmon path and I said to Satnav I knew the way go on. He still hung back so I decided to catch the group. I accelerated then had to brake suddenly along a grate. All I remember is the back wheel sliding from under me so I applied front wheel brakes and went over the handle bars. Satnav first on the scene got me to sit on a rock whilst he rang an ambulance. Up till then I had never broken a bone but I knew I had done just that. I was operated on that evening. Still have the titanium plate and six screws. Actually was too embarassed to feel any pain. I remember the Peppous and B2Bs coming through talking to Satnav as the ambos arrived then went gaga as they gave me the gas. Captain later named in the the ride report “Ravi the Grate”. A ride not to forget. Megan told me not to ride with the ERs again as for six months I was riding alone and nothing happened! Good thing I didn’t take her seriously…..
My advice for riders at the back of the peloton is don’t try to get to the front as I will get left behind (I’m still at the back four years later). My philosophy is it is all about enjoying the ride and the company. I like a challenge but am not competing with anyone except myself to improve. I try to set small achievable goals and stick to them. In my school years I was known as the “concert pianist” and harboured ambition of one day performing with the SSO. At uni I could not complete both my music and accounting studies and with 8 job offers from all the major accounting firms after finishing my economics degree I decided the money in music did not compensate the ambition. I failed my final music exams and have hardly touched a piano since. This entry was posted in Rider of the Week on 18 February 2013 by Drastique.